(1962) "The Burning of Atlanta"
"Wolverton Mountain" was a hit that established Claude King's career as an American country singer/songwriter in 1962. 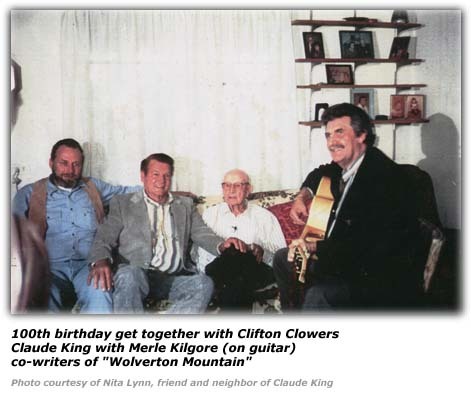 The song was a rewrite of the original version by Merle Kilgore, which was based on a real person named Clifton Clowers who lived on the mountain (the mountain's actual name being spelled Woolverton. ), north of Morrilton, Arkansas. The song spent nine weeks at the top of the Billboard country chart in the US in 1962. It was also a giant crossover hit, reaching number six on the pop chart and number three on the easy listening chart. The song's storyline deals with the narrator's desire for Clowers' daughter and his intention to climb the titular mountain and marry her. It opens with the recounting of a legendary warning to the listener not to "go on Wolverton Mountain", as its inhabitant Clifton Clowers, who is "handy with a gun and a knife", poses a lethal threat to anyone who tries to approach his beautiful daughter, whose "tender lips are sweeter than honey". If a stranger attempts to enter, Clowers is alerted by "the bears and the birds". The narrator has decided to defy Clowers and climb the mountain despite the acknowledged danger. What will eventually happen to him is not revealed in the lyric, but the positive tone suggests optimism. Clifton T. Clowers was born on 30 October 1891, at Center Ridge, Arkansas, son of Thomas Jefferson Clowers and Mary Prince Clowers. In July 1919, he married Esther Bell. He was a veteran of World War I and a deacon in the Mountain View Baptist Church. He was immortalized by the success of "Wolverton Mountain." He lived most of his life on a farm located on the northern edge of Woolverton Mountain. On his 100th birthday Clowers was visited by both writers of the song, King and Kilgore. He died at the age of 102 on 15 August 1994 at his home in Clinton, Arkansas, and was buried at the Woolverton Mountain Cemetery. Country singer Dickey Lee, who was still emerging on the music scene at the time, covered the song just months after it was released. Nat King Cole covered the song for his 1962 album Ramblin' Rose. Bing Crosby covered the song for his 1965 album Bing Crosby Sings the Great Country Hits. Jerry Lee Lewis also recorded a version of the song that year. In 1962, Australian country and western singer Kevin Shegog recorded the song and it was a popular hit in Australia. In 1966, Olle Adolphson scored a Swedish language-version hit, with lyrics by himself as "Skattlösa bergen", at Svensktoppen. In 1988, Lasse Stefanz recorded the song with these lyrics. In 1975 Roman Stewart recorded a reggae version. Dubbed by King Tubby in 'Wolverton Mountain version' by Treasure Isle All Stars. In 1994, Josey Wales made a dancehall version 'Cowboy Style'. An answer song, "(I'm the Girl from) Wolverton Mountain", was recorded by Jo Ann Campbell, released in August 1962 ("Yes, I'm the girl from Wolverton Mountain / I wish someone would make me their wife"), and hit the Billboard charts (#38 pop, #24 country, #10 AC). The song also achieved popularity in Australia in a version by Dorothy Baker. The song was also parodied by Marty Cooper (as "El Clod") in a version called "Tijuana Border (Wolverton Mountain)" It reached #111 on the Billboard Bubbling Under chart in the fall of 1962. Great Plains covered the song in 1997. Writer Merle Kilgore praised Great Plains' cover, saying that it was the first time since King's original that the "magic" had been recaptured. ^ "Hiking Trails, Mountain Bike Trails & Trail Maps | Trails.com". Archived from the original on 2012-09-28. Retrieved 2015-04-13. ^ Whitburn, Joel (2004). The Billboard Book Of Top 40 Country Hits: 1944-2006, Second edition. Record Research. p. 190. ^ Whitburn, Joel (2004). The Billboard Book of Top 40 Hits: Eighth Edition. Record Research. p. 346. ^ "images/story/1/11211g". hillbilly-music.com. Retrieved 2015-04-13. ^ Billboard. Nielsen Business Media, Inc. ISSN 0006-2510. Retrieved 2015-04-13. ^ Whitburn, Joel (2002). Top Adult Contemporary: 1961-2001. Record Research. p. 136. This page was last edited on 19 November 2018, at 01:57 (UTC).